Forbo Flooring Systems can enhance any interior environment by offering innovative and beautifully designed flooring products delivering long life and consistent high quality. With a comprehensive range of products for commercial, public sector and residential interiors including linoleum, project vinyl, carpet tiles, flocked flooring and fully integrated entrance systems. 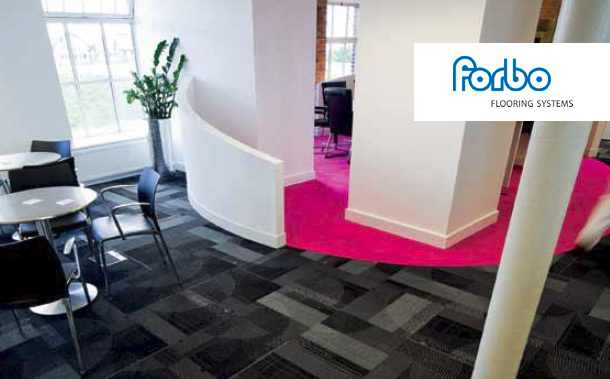 A range of subfloor systems, Eurocol and floor care products also complete this extensive and versatile portfolio, Forbo Flooring Systems can deliver ‘total solutions’ for every project, assuring quality and accountability from a single supplier. The Forbo Solution that was offered has had a great impact in the environment that we work. Finsbury did a great job in sourcing and fitting the solution for our business needs.